An idiom is a type of figurative language that is used by authors of short stories and novels to make their stories more interesting. It's important for students to understand and master this comprehension skill. 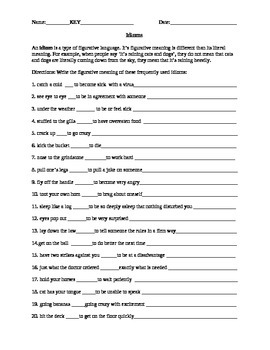 This worksheet reviews twenty common idiomatic phrases for the students to define. An answer key is included. Written by Jane Maitski.This work is licensed under a Creative Commons Attribution-NonCommercial 3.0 Unported License.